Last updated by Mark Jala at April 24 . Cuisinart Chefs Classic cookware comes in stainless steel, anodized aluminum and cast iron varieties. Reviewers love the Cuisinart Chefs Classic cookware. The stainless steel variety is clad on the bottom with aluminum to help distribute heat evenly. The anodized aluminum version doesn’t need to be clad as the aluminum core helps surround the food with a naturally even heat. The cast iron version has a porcelain enameled and is dishwasher safe. For the price, Cuisinart Chefs Classic cookware is an excellent bargain. Please note: The bullet points above and the dashboard below are for the Stainless Steel version. Cuisinart Chefs Classic cookware is hugely popular and deservedly so. It is excellent cookware for the price. 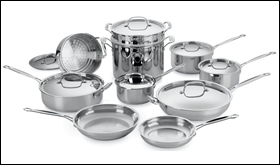 This makes excellent cookware for beginners to medium level cooks looking for good cookware at an excellent price. Matching 18/10 mirror-polished stainless-steel lids seal in moisture and nutrients. Tight-fitting stainless steel lids fit tight to lock in flavor, texture and nutrients. Wide, easy grip handles. Staub cast iron cookware is innovative and beautiful. With self-basting lids and textured dark interior enamel, Staub cast iron cookware is top quality. Staub enamel is a healthy cookware material being PFOA and PTFE free, lead free and cadmium free. Made in France, Staub cast iron cookware rivals the best the world has to offer. Staub is in the same class as Le Creuset cast iron cookware. With innovations not found on Le Creuset, Staub presents a unique opportunity to have something really special. The piece I have and use is beautiful and I love the way the self-basting spikes makes food even more moist and juicy. Staub cast iron cookware is a worthy investment. Fits chickens up to approximately 5 lbs. Lodge Enameled Cast Iron cookware is fine American made enameled cast iron cookware that rivals French offerings, and at much lower prices. Lodge enameled cast iron cookware is available in skillets, roasters, apple pots, Dutch ovens, and covered casseroles. It is available in numerous colors. Lodge Enamel cookware is cast from molten iron in individual sand molds. A layer of black, matte enamel and two layers of glossy, durable porcelain enamel are then added to create a surface that is chip resistant and nonstick. It’s cast iron that eliminates the need for seasoning, is hygienic, non-reactive to acidic foods and other foods, and creates an easy clean up surface. Lodge Color enamel cast iron is safe on your gas, electric, induction or ceramic stove. Lid knobs are oven safe to 400 degrees Fahrenheit. This cast iron cookware is dishwasher safe but if you wish to preserve your glossy exterior, hand washing in soapy water is highly recommended. Dishwasher-safe, but washing by hand recommended; lifetime warranty. The price is stated as Medium because of the wide range of products offered at a wide range of prices. 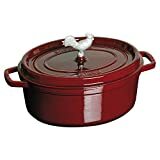 6 Quart Dutch Oven, Red. A flawless pairing of form and function that doesn't quit, the Lodge Dutch Oven is an enameled cast iron classic that's great for preparing and serving memorable meals. WHAT IS PORCELAIN ENAMEL ON CAST IRON? It is actually glass that becomes bonded to the cast iron at high temperatures. A particulate of glass, called frit, is applied to the cast iron vessel and then baked at temperatures between 1200 and 1400° F. The glass frit melts and fuses to the cast iron, forming a bond. Porcelain enamel on cast iron is heat tolerant and impervious to water and other consumables. FAMILY-OWNED. Lodge is more than just a business; it's a family. The Lodge family founded the company in 1896, and they still own it today. From environmental responsibility to community development, their heads and hearts are rooted in America. Lodge seasoned cast iron cookware is available in a wide array of styles from traditional to exotic. There are 3 kinds of Lodge seasoned cast iron cookware; Logic, Pro Logic and Signature. The all have the same seasoned cast iron but differ in styling. The Signature cookware has stainless steel handles. Lodge has a system for pre-seasoning cookware that they developed in 2002. Normally, cast iron sticks and is not considered to produce foods that cook as well, or taste as great until countless meals produce a black, rich patina on the bottom. Lodge duplicates that affect by spraying vegetable oil and cooking it in a high temperature gas oven. The best way to care for this cookware is to remember that it’s iron. After cooking clean with a stiff nylon brush and hot water, soap is not recommended and detergents should not be used at all. Cloth towel dry immediately and apply a bit of oil while it’s still warm. Lodge Seasoned Cast Iron comes from a family business that still operates out of the tiny Appalachian community of South Pittsburg , Tennessee where they were founded in 1896. Lodge Cast Iron produces the most extensive selection of high quality cast iron goods on the market. The company prides itself on its eco-friendly practices that include recycling and even planting trees. Prices are affordable, and their products are so durable that many of their skillets, Dutch ovens and griddles made over 100 years ago are still in use today. Made in the USA. Sturdy. Lodge cookware can last for generations. If you need to season your Lodge seasoned cast iron cookware, please see the article on How to Season Cast Iron Cookware. Lodge 10.5 Inch Square Cast Iron Grill Pan. Pre-seasoned Grill Pan with Easy Grease Draining for Grilling Bacon, Steak, and Meats. Le Creuset cookware, enameled cast iron cookware, is one of the top 3 makers in the world. Attractive as much as it is functional, it is a mandatory piece of cookware in every complete kitchen. Le Creuset has been making one of a kind, cast iron cookware since 1925. Le Creuset Enameled Cast Iron comes in 10 different categories. There are round ovens, oval ovens and soup pots, buffet casseroles and saucepans, skillets, grill pans, roasters and specialty items, and a garden collection. Trivets and sets, accessories, and Dijon round out the choices. Le Creuset sells several different types of enameled cast iron sets, ranging from every possible piece imaginable to frying sets to mix and match sets including their stainless steel and stoneware products. Le Creuset enameled cast iron cookware is durable vitreous enamel and prevents the cast iron from rusting, assists with cleanup, and creates a nonstick surface. Le Creuset cast iron cookware is best known for its heating properties. The thick walls and bases of this cookware make it function best at a medium heat setting. This cookware is ideal for all kinds of slow cooking, as well as keeping the food warm for a long period of time after it’s ready. Le Creuset cookware has a colorful, long-lasting exterior enamel that resists chipping and cracking. The interior enamel is engineered to resist staining and dulling. The sand-colored interior enamel makes it easy to monitor food as it cooks, preventing burning and sticking. Le Creuset oversized handles provide even weight distribution and a secure grip. The ergonomic composite knobs are heat resistant to 500°F. Le Creuset cookware even has built-in lid stabilizers to provide a secure, no-slide fit. Le Creuset is also the lightest weight per quart of any premium cast iron cookware available. Le Creuset enamel is not only pretty but also very functional. Le Creuset reviewers say their enamel cleans better than others and doesn’t stain. Crafted to deliver the latest enameled cast iron innovations with the added space and capability of Le Creuset's classic oval ovens, the Signature Collection oval French Oven is ideal for preparing larger one-pot meals, whole fish filets or even a rack of ribs. Handcrafted one at a time inside our Fresnoy-Le-Grand foundry for nearly a century, Le Creuset French Ovens have been a fixture in homes around the world for generations. Their enduring quality, wide-ranging versatility and stylish colors have made them indispensable in the kitchen and cherished around the table. Handcrafted one at a time inside our Fresnoy-Le-Grand foundry for nearly a century, Le Creuset French Ovens have been a fixture in homes around the world for generations. Their enduring quality, wide-ranging versatility and stylish colors have made them indispensable in the kitchen and cherished around the table. Le Creuset 12" Iron Handle Skillet - Dune Le Creuset classic touch for the modern table introduces Dune, the newest color addition to our cast iron repertoire. The Dune collection complements any color palette and makes the perfect gift. Only Le Creuset offers such a wide range of unique shapes and designs. This product offers unrivalled flexibility of use, excellent heat efficiency, and the versatility to use it on any stovetop, under the broiler, or in the oven. Our products are not only functional, but also beautiful to put on display or bring to the table for entertaining. Le Creuset is consistently chosen by leading chefs, restauranteurs, and those who just enjoy cooking, all of whom appreciate its performance, cooking advantages and style. Works on all heat sources - gas, electric, induction or glass top. Crafted by hand since 1925, each individual pot is made in its own sand mold and passes through the hands of more than 30 craftsmen during the manufacturing process. Measuring 9-3/4 inches in diameter, this shallow round-shaped tarte tatin pan makes a delightful addition to any home-chef's collection of cookware. Use it for anything from freshly baked upside-down cakes and fruit pies to the classic French pastry known as tarte tatin. 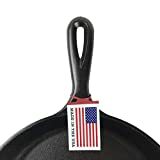 The authentically styled pan features a wide flat base and uniquely inverted cast-iron side handles, surrounding the rim and growing wider, loop style, on two sides for a secure grip when flipping the dish to release contents onto a plate or platter. Like other pieces in Le Creuset's line of enameled cast iron, the cookware's exterior features a colorful, long-lasting enamel that resists chipping and cracking, while its durable, nonreactive, sand-colored interior enamel offers a smooth surface for cooking and baking. As cast iron is unexcelled for even heat distribution and superior heat retention, and enamel is impervious to acids and odors, the vessel cooks food uniformly and gently without hot spots and can be used for cooking on the stovetop or finishing in the oven. The cookware can be safely used at any oven temperature, under the broiler, and on any stovetop surface, including induction. Best of all, it moves gracefully from the oven to the table for serving to the refrigerator or freezer for storing leftovers. 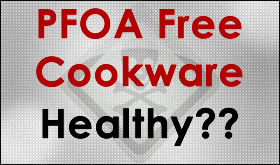 The cookware carries a lifetime limited warranty and should be hand washed for best results.